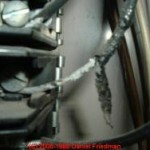 Aluminum wiring, used in some homes from the mid 1960’s to the early 1970’s, is a potential fire hazard. How safe is aluminum wiring? According to the U.S. Consumer Product Safety Commission, fires and even deaths have been reported to have been caused by this hazard. Problems due to expansion, or more likely micro-fretting and arcing at the connectors, can cause overheating at connections between the wire and devices (switches and outlets) or at splices. The connections can become hot enough to start a fire without ever tripping a circuit breaker! 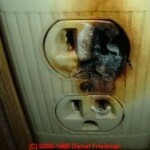 The photos shown above are not the most dramatic catastrophes linked to fires caused by aluminum wiring. But these are conditions that are found in many homes with aluminum wiring, confirming that this is a real, common, and widespread hazard. CPSC research shows that “homes wired with aluminum wire manufactured before 1972 are 55 times more likely to have one or more connections reach “Fire Hazard Conditions” than are homes wired with copper. “Post 1972” aluminum wire is also a concern. Introduction of the aluminum wire “alloys” in 1972 time frame did not solve most of the connection failure problems. Aluminum wiring is still permitted and used for certain applications, including residential service entrance wiring and single-purpose higher amperage circuits such as 240V air conditioning or electric range circuits. The fire risk from single purpose circuits is much less than for branch circuits. But it’s not necessarily because of a “new alloy” as some folks assert. It’s because there are enormously fewer connections (four or six rather than 30 or 40 per circuit) and thus statistically a smaller chance of a connection failure. These connections do still burn up, as indicated by field reports.